Safe, quiet location at end of a cul-de-sac (little traffic - kid-friendly) facing beautiful, expansive golf course views. Extra wide windows make your vacation bright and cheerful. First-floor unit with convenient, easy access. PET FRIENDLY. Paved path to the beach, Shipyard Beach Club, Sonesta Resort and VanDerMeer Shipyard Racquet Club (three blocks = four-minute bike ride, twelve-minute walk). FREE WIFI with two desk areas. This villa just keeps getting better. Recently refreshed, repainted and redecorated for comfortable vacation living. Catch that mid-century modern vibe with vintage dining and media furniture. Flat screen smart TV in living room. Sofa bed in living room. Well-equipped kitchen with granite countertops & full-sized appliances. Dining table for six as well as bar stools. Full size laundry. Master bedroom with king-size bed, flat screen TV and master bath with tiled walk-in shower & double vanity. Guest bedroom with two twin beds and updated shower bath. Cable TVs in both bedrooms. Desks for office/internet use. On-site pool and hot tub for Colonnade Club guests only. Planning a FAMILY OR FRIENDS GATHERING? Check out our other Colonnade Club villa just three doors away at 197 Colonnade - VRBO #602282. NEED MORE SPACE? Check out our three-bedroom in Tennismaster in Shipyard, too. - VRBO # 1478685. 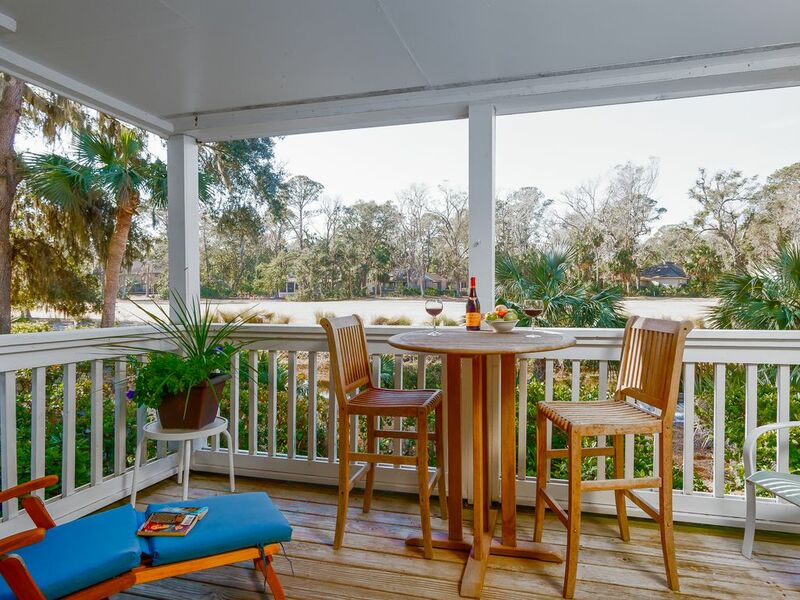 Shipyard Plantation is a small treasure in Hilton Head Island's fine gated communities. It is centrally located and easily accessed by the Cross Island Parkway. Within Shipyard, there are the world class tennis facility VanDerMeer Shipyard Racquet Club and Shipyard Golf Club, rated one of the finest layouts on the PGA Senior tour. The abundant natural wildlife and unique atmosphere make Shipyard a tropical paradise. It is less than a half mile to Coligny Circle or the Shelter Cove Mall. An easy 12-minute drive takes you to the historic lighthouse in Harbour Town. Enjoy Shipyard's beautiful atmosphere while biking or walking from Colonnade Club on the numerous bike paths lined with tropical vegetation. Special DISCOUNTED BIKE RENTALS. Contact us for promo code. If you prefer to drive to the beach, Shipyard has private parking for beach access. We are a family of four with two sons and a Wheaten Terrier. That description was when we first purchased. Since then the boys have grown up and moved on, and we are on Wheaten Terrier #3. Self-managing our vacation rental condos has become my next career which I'm greatly enjoying. Like many owners, we fel l in love with Hilton Head Island on a family vacation. It offers everything we love and activities for all of us, especially tennis, golf and the beach. We also LOVE to bike on the miles of paths throughout the island. Our HHI vacations are generally active ones, walking on the beach with the dog, tennis, golf and biking. It's also so relaxing and peaceful, sitting on the deck reading or cooling off by the pool. The birds are a wonderful distraction. Just leave a few crumbs on the deck railing and see what appears! Don't feed the 'gators; just watch their prehistorical beauty from a respectful distance. Expansive views of #6 on Shipyard's Galleon course, a long Par 5 hole. Bath towels only. No beach towels. Mid-century modern table & six chairs. Also two stools at the bar. Mid-century modern storage & decor unit, and bar with drawers near table. Enjoy the outdoors on the large covered deck overlooking the golf course, or on the front porch deck. More than 350 tennis courts on Hilton Head Island! The closest are five minutes away! Lots & lots of courses on and off the island. Your beach vacation can be romantic, family, historic and sightseeing and/or sports and activities. Or it can just be for you and whatever you want it to be. Make it what YOU want and enjoy! Our family stayed here for three weeks in December and we thoroughly enjoyed the location and coziness of the property. There’s a wide paved walking/biking path to the beach and it connects with other paths for varied options. The unit is at the end of a cul-de-sac, making it quiet and nice for folks with pets and/or kids. There are nice golf course views from the covered rear porch and on pleasant days it’s nice to relax on the private porch. One of our favorite things about this condo is it’s proximity to all the things we love to do on the island including great dining, shopping, movies, miniature golf, pottery, and even an escape room. And we cannot fail to mention how terrific the owner is. Book this place, pack your bags and come relax! What a great review! Thank you! So glad you enjoyed your stay. And yes, the location is one of the best features of 191 Colonnade Club. Hope you come back to visit again. Well...due to Hurricane Florence, I had to spend Sunday night in the South Carolina Welcome Center parking lot, so I didn't arrive until Monday morning. Needed a shower desperately after being in the car for 29½ hours and water for the dog, but the water was shut off because they were working on water line in front of Unit 189. Luckily, one of the workers gave me water for my dog. Once the water came back on, I was getting ready to jump in the shower when the shower head shot off! I don't know if it was broke to begin with or the air in the lines (from the repair) caused pressure issues. So...I move into the other bathroom, put my towel on the rack and one side of the rack comes off the wall! Not a good start to my vacation!! Tuesday through Friday, however, were incident free, so all in all I enjoyed my stay! Very comfortable bed in the master bedroom. The deck is very nice as well with a heavy duty sliding glass door. I know it was sort of off season, but the unit almost seems sound proof. Well constructed units. Kitchen was well stocked with equipment. Could not find extra trash bags though. About a 10 minute walk to the beach from the Unit. I would do it again...minus the hurricane. Overall we had a very good experience! The beach was a quick 5 minute bike ride or 10-15 min walk. The condo was well equipped and we definitely enjoyed the back patio. There is a lagoon in the back of the condo that my husband enjoyed fishing in. The hot tub was also a nice amenity. Coligny is a short drive away and is one of our favorite places in HHI. You can also bike there from the beach access in about 15 minutes. We did have two issues during our stay. The wifi went out but once we made the owners aware we were able to share with a neighboring condo. Our air conditioning also went out late one night. They had someone there the next morning to fix it but it did make for one very hot night. Besides these issues we had a fabulous stay! I'm so glad you enjoyed your stay. The location is one of the best reasons we love Colonnade Club. And thanks for letting us know about the issues you faced. We always try to resolve any problems as soon as we can. But can't resolve problems when we don't know about them. Sure wish we could control everything about the villa, but when the area-wide internet goes out or the air conditioner blows a capacitor, it's out of our control. Thanks for understanding. Very nice layout. Location, location, location! Condo was in a very quiet area and located in the last set of buildings on the drive. Very nice floor plan. Five minute bike ride to the beach! Overall the property was nice and convenient. The walk to the beach was a bit long (.6 miles each way) but it was a pleasant walk and easy to access. The condo was great. It accommodated 4 of us with no problem. It was well stocked with everything you need to stay for a week or two. The property itself faces a golf course so it was nice and quiet. $125 non-refundable pet fee. Four night minimum stay. Monthly or last minute discounts may be available.